Domestic water use includes indoor and outdoor uses at residences, and includes uses such as drinking, food preparation, bathing, washing clothes and dishes, flushing toilets, watering lawns and gardens, and maintaining pools. Domestic water use includes potable and non-potable water provided to households by a public water supplier (domestic deliveries) and self-supplied water use. 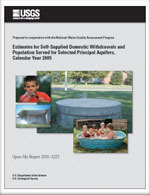 Self-supplied domestic water use is typically withdrawn from a private source, such as a well, or captured as rainwater in a cistern. The majority of people in the United States used water provided by public suppliers. Domestic deliveries by public water suppliers totaled 23,300 Mgal/d in 2015 and represented water provided to 283 million people at single-family and multifamily dwellings. Self-supplied withdrawals for domestic use were estimated at 3,260 Mgal/d, or about 1 percent of total withdrawals for all uses in 2015, supplying an estimated 42.5 million people. Nearly all (98 percent) of these self-supplied withdrawals were from fresh groundwater sources. Self-supplied domestic withdrawals declined 8 percent between 2010 and 2015. Total domestic use (withdrawals plus deliveries from public supply) declined about 3 percent over this period. Public-supply deliveries for domestic use are not available for 1950, 1955, and 2000. Values for 1960-1980 include distribution system losses. Methods for estimating domestic deliveries from public suppliers included surveys of public-supply sales information, calculations using coefficients for per capita use, and development of average percentages of deliveries to various customer categories. Self-supplied domestic withdrawals are rarely metered or reported; typically this usage is calculated by multiplying an estimate of the population not served by public supply by a coefficient for daily per capita use. For some States, these coefficients are county-specific averages derived from observed residential water use and population estimates in nearby areas served by public suppliers. Other States use the same coefficient for all counties, commonly one used by State regulatory or planning agencies. Below are publications associated with domestic water use. Kenny, Joan F.; Juracek, Kyle E.
Description of 2005-10 domestic water use for selected U.S. cities and guidance for estimating domestic water use; 2012; SIR; 2012-5163; Kenny, Joan F.; Juracek, Kyle E.
Maupin, Molly A.; Arnold, Terri L.
Estimates for self-supplied domestic withdrawals and population served for selected principal aquifers, calendar year 2005; 2010; OFR; 2010-1223; Maupin, Molly A.; Arnold, Terri L.